Legend has it that the first Black Knight was the son of Arthur, sired before he became King of his Realm. The Black Knight had a falling-out with his father, and left the Realm to wander the world. After braving The Depths, he returned to Arthur’s court a changed man. On that day, he swore to forever fight by Arthur’s side. Those who join the Black Knights swear an oath to follow Arthur into battle, no matter where it takes them. They prefer to wear black clothing, a signal to the enemy that death is coming. Each wound sustained to a body part beyond the first has its power substantially increased. Armor worn with engravings loses a significant percentage of its mitigation value. Damage mitigated by armor increases the mitigation value of the damaged armor pieces for a brief duration. Armor mitigation is greatly increased for physical damage taken from the front. Deals crushing damage to the target and applies a physical debuff that increases the amount of crushing damage taken by the target for a brief duration. Applies a physical buff that increases movement speed for a brief duration. Colliding with an opponent while under this effect deals crushing damage based on the user’s movement speed and cumulative armor mitigation. Applies a physical buff to the user that greatly increases damage mitigation from armor and suppresses wound effects for a brief duration, after which a physical debuff is applied to the user that reduces their stamina regeneration for a moderate duration. A highly damaging strike that may only be used when the user is near to receiving a fatal wound, dealing bonus damage based on the number of wounds sustained. 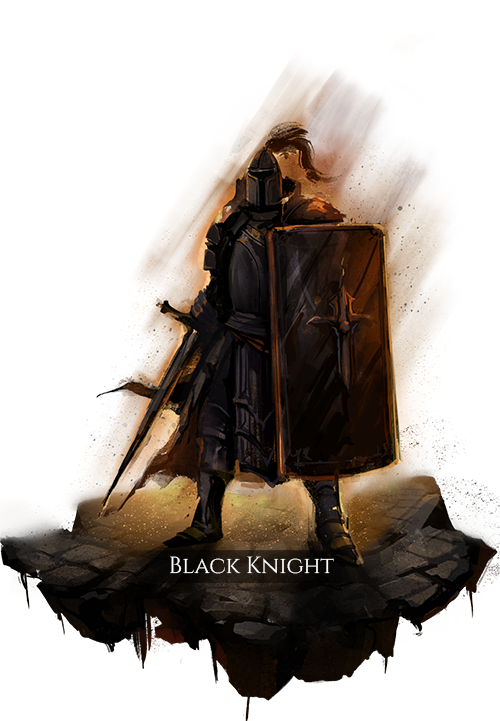 Inflicts panic on nearby enemies, and applies a physical debuff that greatly reduces the power of their damage-dealing abilities against other Black Knights for a moderate duration.